It is about to get dark; our driver drops us a bit further away from our destination due to some wastewater drains splitting the road. Worn-out by a day of roving the Bamyan countryside, we walk dragging our feet into Mohammad Ibrahim Dadfar’s office. 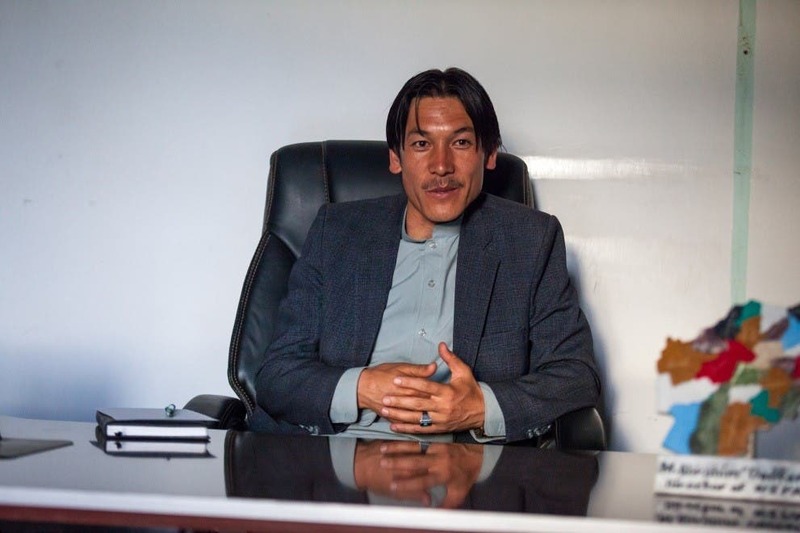 Dadfar is Director of the National Environment Protection Agency in Bamyan. Although he spent the day collecting data from the field, we met an enthusiastic man who welcomes us with a warm smile on his face and, surprisingly, what was originally planned to be a 20-minute informational meeting turned into over an hour of lively conversation. I travelled with my two colleagues from Kabul to visit our projects in the province of Bamyan. This province – nicknamed the place of shining light – lies in central Afghanistan and hosts the majority of the Hazara people, a Shiite group recognized by the Afghan Constitution as one of the fourteen official ethnicities. Bamyan is better known for the Buddhist masterpieces carved into the side of a mountain: two gigantic Buddha statues that used to dominate the city of Bamyan. “Used to”… Unfortunately, the Taliban, who were then ruling over most of Afghanistan, declared the status pagan “idols” and decided to destroy the 1,000-year old effigies. These two sculptures, one male figure about 53 meters high and one female representation around 35 meters high, were built between the 3rd and 6th century A.D. Cultural destructions have previously occurred in warfare, whether as a result of bombardment or as the expression of religious hatred. However, this destruction by the Taliban shook the inhabitants of Bamyan as an unprecedented phenomenon. The world witnessed a meticulously planned destruction, previously announced to the press and a fully documented process. The Taliban intended this demolition of art to reach beyond the borders of Afghanistan. 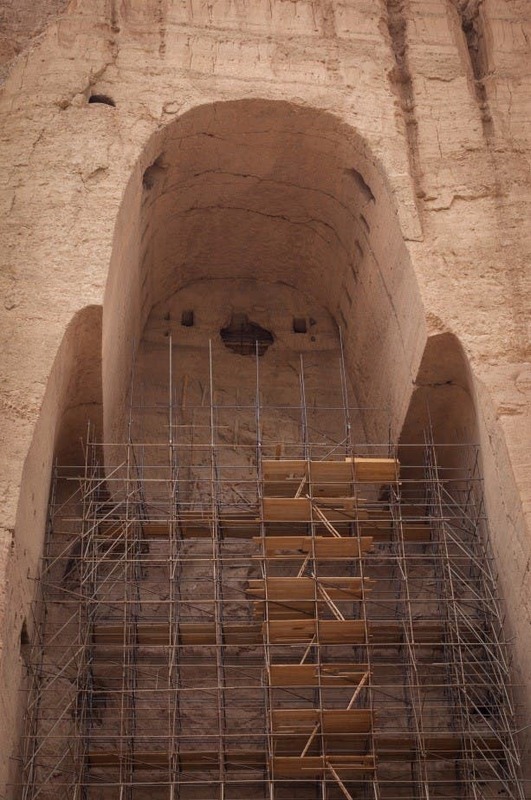 However, Dadfar explains that the local population suffered immensely from the loss of this defining element of Bamyan region heritage, which was also a key source of touristic revenue. He recounts that under Mohammad Daud Khan, Afghanistan Prime Minister between 1953–1963, the province income from visitors and pilgrims was over $800,000 per year; henceforth, the inhabitants felt deprived from economic growth opportunities, especially in a country having suffered decades of war. Even though Bamyan is an exception in terms of provincial stability, the region faces the same developmental challenges as the rest of the nation; human migration is amongst them. Dadfar himself is not from Bamyan, but from a neighbouring province called Daikundi. He came to Bamyan to fulfil his duty as director. He mentions that human informal settlements result in fast pace unplanned urbanization. The direct impact is that the amount of waste cities produce increases at a faster pace than human capacities for collecting solid waste or building wastewater treatment system. Within his mandate, Dadfar tries to trigger some behavioral changes among the local population through awareness-raising activities. More recently, his office launched concrete actions with a two-day campaign during the World Environmental Day. The initiative gathered 600 environmental NGO professionals working hand-in-hand with local communities to collect solid waste and separate organic waste from inorganic waste. The latter was burnt further away from the city on a dumping site. Dadfar acknowledges such sporadic measure are not sustainable but it is intended to make people more self-conscious of their environment. Still, he considers non-treated wastewater discharge as a more critical issue. There, he flags how the problem is often overlooked: non-treated wastewater pollutes the environment and carries pathogens harmful to human health. In Bamyan, water is easily accessible but the quality of the water is questionable. The non-treated wastewater discharged contaminates the Dare Foladi River in the Baba Mountain, passes the Shahedan areas, and flows into Kabul river. This water carries microorganisms causing infectious diseases such as cholera. Dadfar indicates reports collected from the five hospitals in the province confirm water-borne diseases are endemic to the region. Additionally, Dadfar emphasizes that Bamyan is not a special case; Kabul currently experiences pollution of its river and groundwater too. In fact, such correlation between sanitation and health is applicable to the whole country: our Afghan Office has found out that 100 Afghani [$1.32] invested in sanitation saves 500 Afghan Afghani [6.59] in public health and environmental protection expenses. 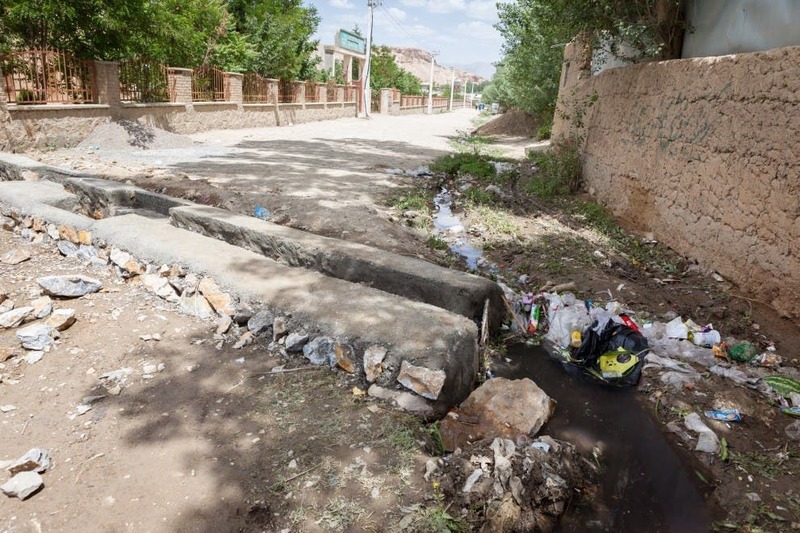 Nonetheless, sanitation is not an investment priority and neither is public health as we learnt during previous interviews with a professor from the University of Kabul. For instance, the government currently allocates a budget of $4.3 billion to the Defence and Military Ministry compared to $25 million to higher education. Dadfar did list security as one of the top three concerns of the Afghani people; although Bamyan has not experienced any incident over the past two years, the shadows of the Taliban still linger. I finally seize the opportunity to ask the burning question I have on my mind since the very beginning of our conversation: What about the reconstruction of the 53-meter Buddha statue? The international community has made a lot of noise over the sculpture’s rehabilitation: UNESCO with the support of Japan has spent a tremendous amount of money on feasibility studies to determine how the Buddha could be rebuilt. Indeed, the solution is not as simple as one might imagine. The Taliban commissioned demolition experts and sappers and spent weeks relentlessly attempting to take down the “idols”. After firing anti-aircraft guns, placing anti-tank mines and launching rockets, the colossal statues surrendered. The Taliban obstinacy significantly damaged the cliff. When they finally succeeded, the remaining void was and continues to be vulnerable to collapsing. Dadfar says that the Afghan Ministry of Information and Culture denied reconstruction of the sculpture. His eyes twinkle with an accompanying smirk on his faces; he continues: “I want the statue to be rehabilitated” and he expands on the three reasons that led him to have such a position. First, he believes the sculpture displays the historical and cultural heritage of Afghanistan. Second, the economic growth potential around tourism is noteworthy, especially toward Buddhist believers from Asians countries. Third, the people have the desire to gain this art piece back to protest against Taliban’s oppression and the suffering the fundamentalist movement brought upon the Hazara community who faced persecution because of their sect affiliation. I take his points into consideration but am still not convinced why one would rather invest in attracting more tourists hence producing more waste in a region where the waste generated by the existing population already damages the environment and affects the inhabitants’ well-being. When I raise this issue, he confirms the risk of such tourism expansion. Still, Dadfar is not baffled and points out that the solution to Bamyan city’s sustainable future might lie in the hands of academics at the University of Florence. There, researchers are developing a strategic plan encompassing the reconstruction of the Buddha and the urban-planning of settlements for both local inhabitants and visitors, as well as the preservation of natural areas. At the end, Dadfar reminds me: “Keep in mind we only want to restore one statue. The absence of the second one has to remain as it is now, as a symbol for the world to remember what the Taliban did to us. Because, we surely won’t forget”. The room is completely shrouded in darkness but I am sure I distinctively discern a determined shimmer in Dadfar’s eyes.